This Looter/Crafter is one of the best characters to make Caps in Fallout 76. While you may be unable to explore high-level areas right away, you will be able to get a lot of money and crafting materials by looting low and mid-tier zones. On top of getting an increased amount of loot, Caps, and crafting materials, you will have enough resources to build a big Camp that can produce purified water and food. Crafting also grants experience points, so you can level up pretty fast even if you may be unable to clear the entire Whitesprings resort all by yourself. Trading is still pretty young in Fallout 76, but I predict that players that will be able to craft all the end-game weapons and mods, will eventually make a lot of money in the game. I have decided to build it around non-automatic Pistols, but that is entirely optional. You may as well use any other Gun since there aren't many DPS Perks used. Also, using a Power Armor is mandatory. There is only one defensive Perk taken, and if you want to visit higher level areas this is a must. Below you will find all the recommended Perks for each of the SPECIAL attributes and a brief introduction to this build's equipment, consumables, and mutations. Odealo is a secure trading platform for MMO gamers. Fallout 76 is one of its main markets, where players can Buy, Sell, and Trade Fallout 76 Caps and Items with the use of real cash. When you craft anything, there is a 30% chance you'll get double results! Odealo is a secure marketplace for MMORPG assets including Fallout 76 Caps and Items. It's a gamer-driven marketplace, where players can Buy, Sell, and Trade with the use of real-life money. On Odealo dozens of sellers compete for your attention. 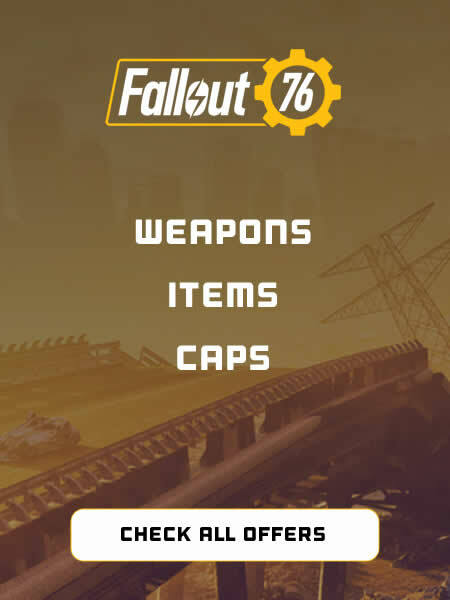 Buying Fallout 76 Items here guarantees best prices, prompt delivery and the best quality of service.